Complete your CPE and enjoy some R&R — head to sunny Florida! December is the perfect time to escape for a week of Florida sunshine. Plus, you'll be sitting pretty for year-end CPE requirements while being fully prepared for the upcoming tax season with this week-long learning event. Sessions to include the popular two-day Gear Up 1040 Individual Tax seminar, Business Entities, Ethics, Estates and Trusts, and more. This comprehensive course covers key tax issues for completing complicated individual returns, including in-depth coverage of recent legislation, case law developments, and relevant notices, announcements, revenue rulings and procedures to help the busy practitioner stay current. Speakers are all practicing preparers who share practical tips to help you get ready for this tax season. We will review the groundbreaking deduction for qualified business income (IRC Sec. 199A), including new guidance on wages and the rental real estate safe harbor. The course will incorporate planning considerations in the wake of the Tax Cuts and Jobs Act (TCJA). The course will also address deductible meals expense in the work place, tackle tax challenges facing special industries including shared economy businesses and marijuana dispensaries, and explore the unique tax incentives offered by Qualified Opportunity Funds. The 2019 business entities seminar is designed for practitioners that advise small business. The course taught by seasoned tax professionals provides the most updated and comprehensive analysis of business tax matters. Real Estate Cost Recovery including the interplay of Code Sec. 179 expenses, bonus depreciation, and 15-year life with regard to qualified improvement property. S Corp. vs. C Corp. planning in the light of flat 21% corporate tax rate and the elimination of the corporate AMT. New interest limits: Will they affect your clients? Handling the new partnership regime changes. The 2019 Gear Up accounting course is designed to give practitioners the information they need to provide review, compilation, and preparation engagements for small and midsized companies. This course is more than just an update and covers a wide variety of topics including core concepts related to financial reporting and accounting and review services, in addition to critical updates to professional standards. The accounting course also features many exhibits, examples, and other practical takeaways to help you implement the content presented. 2019 topics will include SSARS 21 implementation and explanation of the newer SSARS standards 22 and 23. We will discuss and review core concepts in financial statement presentation and disclosures, practice management and quality control issues, specialized practice areas (divorce engagements, personal financial statements, and industry-specific risks and considerations), and special considerations in performing reviews, including using and improving analytical procedures and understanding. The updated course assists the practitioner in assessing fraud risk and practicing in the digital world. The estates and trusts course has been completely revamped. With the estate tax exemption so high now, there will be fewer Forms 706 filed. However, almost every client in our practice will require a Form 1041 at death. So, this year the emphasis is on that funny little tax return that no one wants to prepare. We will de-mystify Form 1041. Areas covered will be general probate and trust terminology, decedent’s final tax return and fiduciary accounting (principal vs. income). Form 1041 will be addressed in detail including, deductions, rental income, basis and capital gain issues as well income distribution deduction. Also covered will be 645 elections, terminations, and the impact of TCJA. Make more...work less...have fun doing it! We’ll teach you the 10 secrets to a successful tax and accounting practice. Learn how to develop relationships with clients and your team so that you can build a firm that has value whether you decide to work or sell it. Optional session, Monday Dec. 9, 8:00 - 11:45 a.m. Optional session, Monday Dec. 9, 12:45 - 2:30 p.m. The Office of Professional Responsibility (OPR) has been very busy, ensuring that Circular 230 Practitioners (that's us) follow rules that prescribe and proscribe our behavior. We will discuss what we can — and must — do to assist our clients while maintaining ethical integrity and complying with Circular 230 rules. Meets CTEC criterion for the two-hour ethics requirement. Optional session, Monday Dec. 9, 12:45 - 4:30 p.m. This class meets the CPE ethics requirements for the Florida State Board of Public Accountancy. We will address the major aspects and recent changes related to the Rules of Professional Conduct as they affect the CPA in public practice and in industry. Early Bird expires July 1, 2019. Save up to $252 with Premier or up to $419 with Premier Plus! View the Magic Week registration page for complete CPE information including fields of study, level, CPE credits, and event schedule with session choices. Delicious breakfast, lunch, and break refreshments are included with the registration price! Learn more about all Gear Up CPE Conferences. Register online or call 800.231.1860 to place your order by phone. Schedule may be adjusted closer to conference date. 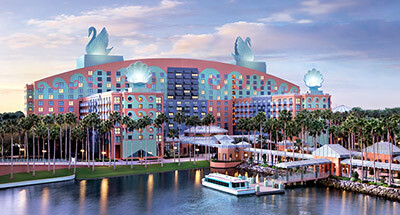 The Walt Disney World Swan Hotel is located in between Epcot® and Disney's Hollywood Studios™. Discover spectacular restaurants, lounges, five pools, a white sand beach and health clubs. Special room rate of $199 available three nights before through three nights after the conference (does not include resort and parking fees). Visit this special 2019 hotel registration form, or call the hotel at 800.227.1500 and mention Gear Up. Price valid for a limited time, or until room block sells out. Don’t forget to register for the conference and reserve your room now, before we sell out! Interested in Sponsorship and Exhibitor Opportunities?